Third release from the Digital Stories made in Budapest 2016. 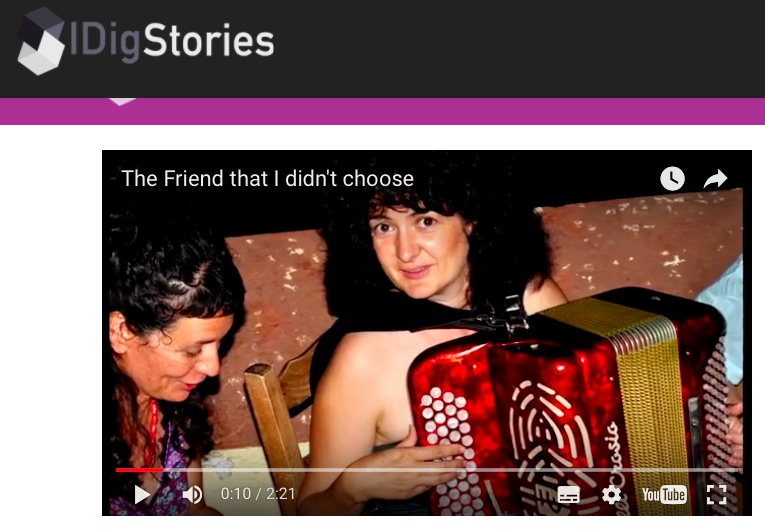 The video "The Friend that I didn't choose" is a creation of Christelle Loukitch, a colleague from Vardakeios. The video tells the story of the ups and downs of a lifelong relationship with an unexpected friend. It is a story of passions, perseverance and patience. A story about friendship. It shows how integration and inclusion can become real through the magic of sharing music and culture. The video is available on iDigStories YouTube dedicated channel HERE, together with other videos which have been released in the project. To favor the view for person with hear-impairment, all videos are available with English subtitles which can be selected directly by the viewer with bottom at bottom right of the video.